Enzyvant is a biopharmaceutical company focused on developing transformative therapies for people with rare diseases. No matter how small the community or complex the condition, we are tireless and purposeful in our efforts to develop and deliver solutions that will bring the greatest benefit to patients with rare diseases and their families. Our current pipeline of therapies is for people with complete DiGeorge Anomaly and Farber disease, and we are working to expand our portfolio to treat people with other rare diseases. We are dedicated to rare disease communities because, at Enzyvant, we believe that rare should never mean alone. The Head of Finance, will report to the Chief Financial Officer, and will directly manage the global accounting and finance function. This position will have responsibility for general accounting, SEC reporting, technical accounting, tax and tax planning, accounts payable and payroll, purchasing, equity administration and financial planning, disclosure/trading compliance and financial analysis. The Head of Finance will also contribute to ongoing Enzyvant work in business development analysis, investor relations input, portfolio financial planning and financings. The Head of Finance, will work in close partnership with the CFO, and will frequently interact with CEO, executive leadership team and our Board of Directors. This newly created role will combine management of day-to-day financial operations with involvement in strategic financial planning and modeling for the company. Manages current team of 4 direct reports and consultants. Improve, enhance and manage the internal reporting processes of the company, including establishment of key performance measures, analyses of results and internal management reporting to support all external reporting requirements and to improve and enhance the overall management of the business. Plans, develops and manages Enzyvant’s budgeting process, including annual cycles and periodic reviews of actual versus forecast. Lead development of annual operating plans. Lead ongoing utilization and implementation of current ERP and other financial systems, manage development of reporting and dashboards utilizing key system data to benefit financial management of Enzyvant ’s business. Management of the independent auditor relationship and supervision of all cyclical audit processes for financial reporting, SOX and other. Provide technical accounting and financial leadership, including input, oversight and guidance on polices and projects. Evaluate transactions contemplated by Enzyvant to assess financial and accounting impact. Evaluate, select and manage a variety of business partners and vendors who serve the needs of the Enzyvant organization. Bachelor’s degree, preferably in accounting or finance, is required, with an MBA or further business education highly desirable. Working knowledge of drug development process within the biotech/pharmaceutical industry is preferred. Demonstrated strength in presenting and communicating financial information. To view this html email as a webpage in your browser, please use this link. Please visit https://www.abfointernational.org/WP/job-postings for additional postings. representations or assurances regarding these positions. Our responsibility for any errors made by us in listing a position is limited to re-posting a correction on this site. Please contact the individual company as set forth in a particular job description if you have any questions. 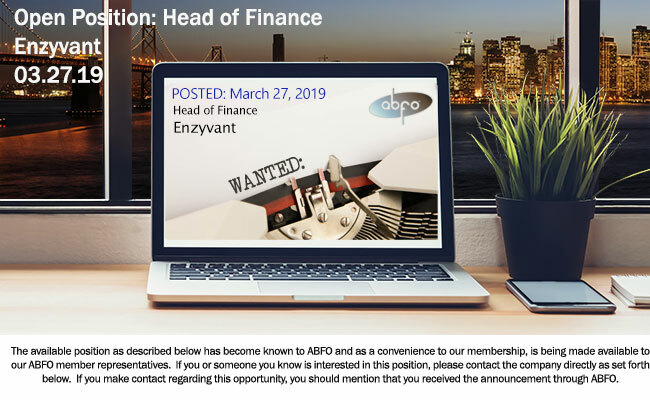 You are receiving this notice because you have indicated interest in ABFO, are an ABFO Member Representative, or have come to one of our meetings.